Sure, you probably hit leg day like every other dude in the gym. But when it comes to dominating the slopes at the beginning of ski season, your everyday routine of squats and deadlifts will only go so far. No, if you want to get through rough conditions and fresh powder with enough muscle to ski all day, you need a specialized skiing workout. 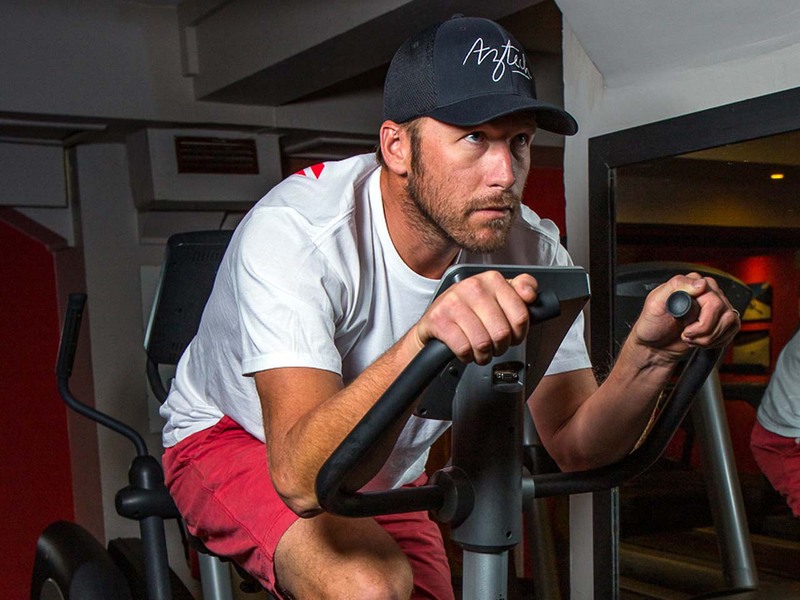 To get a routine that’ll build muscle endurance and raw leg strength to conquer even the mightiest mountains, we talked to Bode Miller, a six-time world champion and Olympic gold medalist. 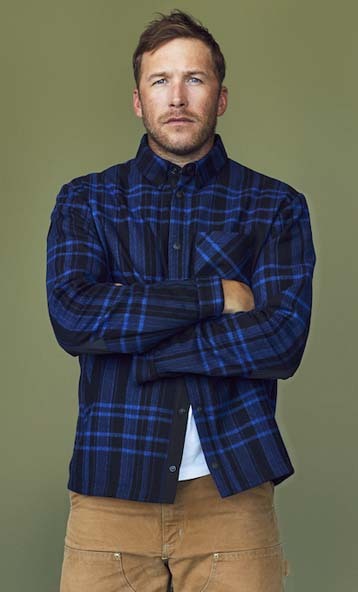 This finely tuned workout regimen has helped the 39-year-old New Hampshire native battle back through any number of gnarly injuries—like the knee issue that benched him for the 2013 season—on his way to becoming the oldest Alpine skier in history to win an Olympic medal. Here, Miller details his go-to skiing workout routine. Other than a slack line or physio ball and a stationary bike, it requires almost no equipment—but it’ll train your legs for serious high performance on the slopes. With this workout, Miller says, “I try to mimic the sport as best I can—not necessarily in form, but in function. In skiing, that means overall leg strength, but also the little muscles in your legs and ankles.” It focuses on three elements: strength/power, muscle endurance, and agility/coordination. Follow that with the metabolic conditioning as directed, then the cooldown. Set up a slack line about 12″ off the floor. If you don’t have a slack line, use another tool for instability, like a physio ball or (if that’s too difficult) a BOSU with the round side up. Get into a plank position, with your forearms on the slack line/ball/BOSU and your feet on the floor. For added difficulty, set your feet on a box at the same height as the slack line; this shifts more of your body weight to the unstable side. You can also switch your position, so your legs are on the slack line and hands are on the box. Do each exercise in sequence. Hold each position for 20 seconds. For single-leg or single-arm exercises, switch after 10 seconds. Do this circuit twice. 1. Plank: Forearms on slack line, feet on floor. 2. Lateral circles: Lift your left leg and move it out to your side. Move it in small circles for 10 seconds. As you put it back down, lift your right arm and do 10 seconds of circles. Right leg is next, then left arm. 3. Single-leg side plank: With both forearms square on the slack line, rotate to your left side as you would in a side plank (hold on with your right hand for balance). Shift your weight to the inside of your right foot, bring your left leg forward, and hold it in front of you for 10 seconds. Bring your left leg back to center, shift your body so you’re on your right elbow, and do the same with your right leg. How to do it: Hop on one leg up a flight of steps, or an equivalent distance up a hill, as quickly as you can. Walk back down. That’s one round. Switch legs each round. How to do it: Grab some cones, or a roll of tape that’s easy to remove (blue painter’s tape or masking tape are both good). Stand with your feet together, and then mark the eight compass points (north, northeast, east, etc.) around you. Standing on one leg, reach for each marker around the circle, trying the whole time to maintain your balance on that one leg. How to do it: Start with a 12” box. Jump off one leg onto the box, making sure to land softly on that one leg. Make sure to fully extend your hips after you’ve landed. Step down with your other leg. Switch legs for each jump. How to do it: Set a stationary bike to the maximum level of resistance you’re comfortable with. Pedal at about 60 rpms for 3 minutes. Rest 3 minutes. Do 3–4 rounds of work-rest. As with the warmup, set your elbows on the slack line or ball and your feet on the floor. Hold each position for 20 seconds. 2. Side plank (one forearm on slack line, other hand on slack line to support).